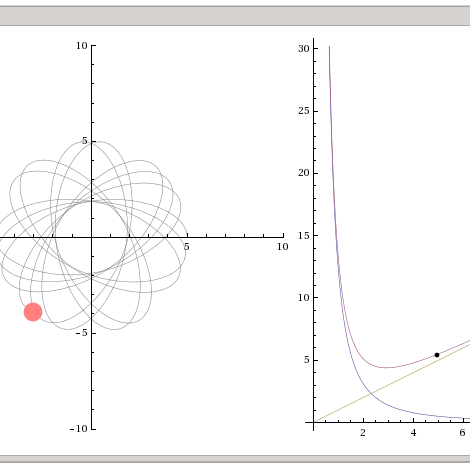 Manipulate the Euler angles in this Applet and observe the rotation in Euclidean coordinates. There is a description of the Euler angles here . This demonstration is useful for points in a three dimensional space. It is found in many visualizing applications. 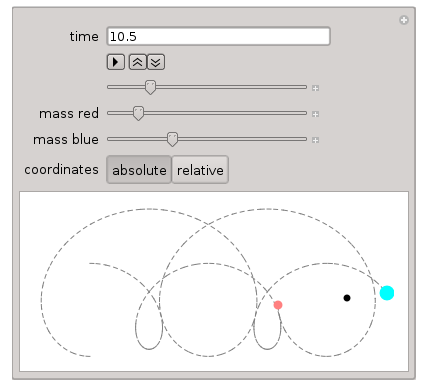 This applet displays the motion of a particle for general spherical potential. One can define the potential and observe the resulting trajectory as well as the effective potential. To execute you need Mathematica or the free Wolfram CDF Player. This applet shows the motion of two bodies with attractive gravity force. Both have the same initial velocities. Varying the masses you can see movement of the center of mass. You can show the motion in absolute and relative coordinates. A two-body collision in barycentric and laboratory based coordinate systems. One can vary the mass ratio and the collision point on the sphere's circumference. Visualization of a damped oscillator where one can vary the frequency and amplitude of the external driving force. A pendulum is a implementation of this oscillator, if the mounting point is variable and serves as the stimulation. An event can be shifted in time. Various projections on the moving coordinate system are visualized. The velocity can be adjusted by the beta factor.